According to Statistics Finland, turnover in service industries grew by 4.9 per cent in July to September from the corresponding period of the year before. 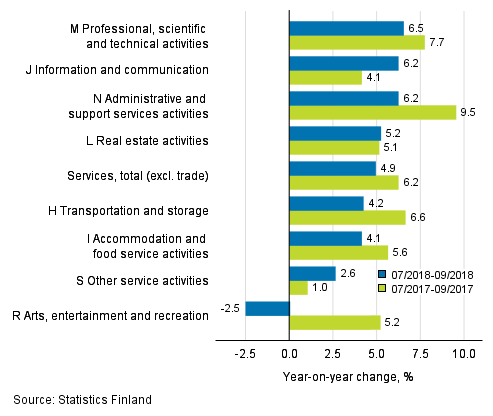 Professional, scientific and technical activities (+6.5%), administrative and support service activities (+6.2%), information and communication (+6.2%) and real estate activities (+5.2%) developed more strongly than average for service industries. Transportation and storage activities as well as accommodation and food service activities developed slightly more moderately. Services are here examined exclusive of trade. Among the sub-industries of professional, scientific and technical activities, growth was most rapid for scientific research and development (+19.0%). Legal and accounting activities (+10.5%) also strongly boosted the industry while the development in the other sub-industries was weaker. In the industry of administrative and support service activities, most growth took place in employment activities (+9.1%) and office administrative, office support and other business support activities (+7.4%). Correspondingly, travel agency and tour operator activities and other reservation services increased by 6.3 per cent. The growth in information and communication activities was upheld especially by the sub-industry of information services activities (+18.6%). The turnover of motion picture, video and television programme production, sound recording and music publishing activities also increased (+17.2%) strongly. Programming and broadcasting slowed down the development of the turnover in the branch with an 8.1 per cent drop from the corresponding period one year earlier. Transportation and storage activities increased by 4.2 per cent year-on-year. Of its sub-industries, land and rail transport rose by 4.7 per cent and warehousing and support activities for transportation by 3.6 per cent. Accommodation and food service activities (+4.1%) increased most due to food and beverage service activities growing by 5.0 per cent from the previous year, while the development of accommodation was 1.1 per cent. ISSN=1799-0998. September 2018. Helsinki: Statistics Finland [referred: 23.4.2019].